Johann Wilhelm Petersen was a German-Danish theologian and Lutheran pastor. With his wife he developed a radical form of pietism in which the belief in Universal Restitution came to play a central role. 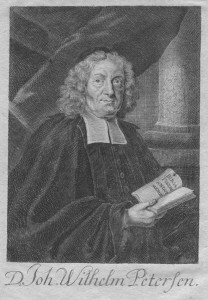 Johann Wilhelm Petersen was a German-Danish theologian, mystic and pastor at the Lutheran Church in Hanover, and later superintendent in Lübeck and Aue. Johann Wilhelm Petersen grew up in Lübeck where he also studied theology. Together with his wife Johanna Eleonora, he developed a mystic and chiliastic form of pietism in which the belief in Universal Restitution came to play a central role.